Why should you learn how to make your own almond milk? It's one of a few easy-to-make alternatives to cow's milk, and is far healthier for you than most commercially available dairy. Though you can purchase almond milk in most grocery stores these days, as you'll see below, it's a snap to make your own at a fraction of the cost. If you regularly suffer from nasal congestion, sinusitis, ear infections, joint pain, asthma, seasonal allergies, hyperhidrosis, indigestion, diarrhea, psoriasis, eczema, or any other autoimmune illness, you may experience significant improvement in your health just by avoiding dairy. Over the years, I've observed hundreds of folks who have made complete recoveries from some of these and other chronic health conditions just by avoiding dairy. So if you experience any chronic health challenges on a recurring basis and you regularly eat dairy products, I encourage you to go for one or two months without dairy - it's a simple experiment that will cost you very little and could potentially make a huge difference in the quality of your life. First, measure out one cup of unroasted almonds. 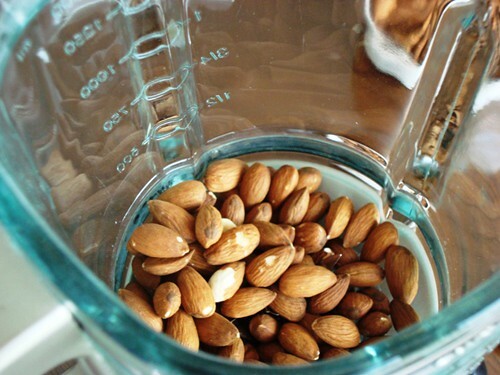 Transfer almonds to a strong blender. My mom has been borrowing our vita-mix over the past few months, so we've been using our KitchenAid as of late - it's quite sturdy and does a fine job with this and other recipes that call for heavy blending. Add three to eight soaked dates. 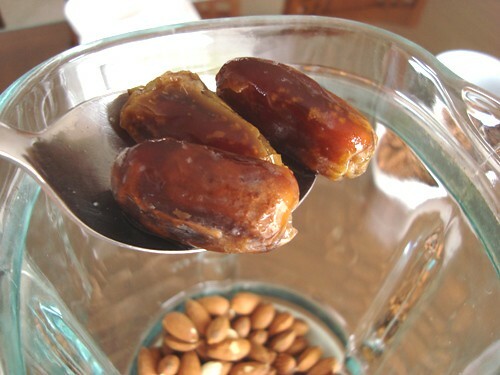 It's best to have the dates soak for at least an hour for easy blending. Three dates if you enjoy only the most subtle hint of sweetness to your milk, and closer to eight if the sweetness of most commercial brands of non-dairy milk is about right for you. Add four cups of cold water. We keep a jug of cold tap water in our refrigerator at all times. There's nothing like a glass of cold water on a hot summer day, right? A water softener that has a quality coconut fiber filter ensures that all of the water that runs through our home is free of contaminants, including chlorine - highly recommended if you're ever in the market for a water softener or whole-house water filter. 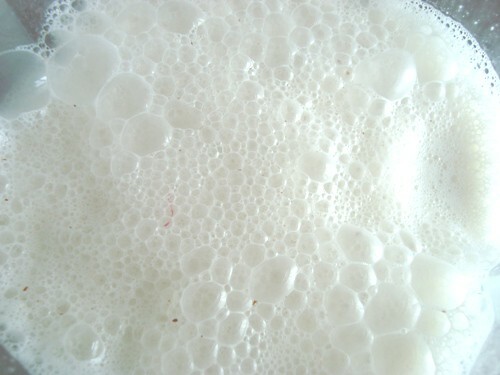 Here's what our all-natural almond milk looks like just a millisecond after being blended. 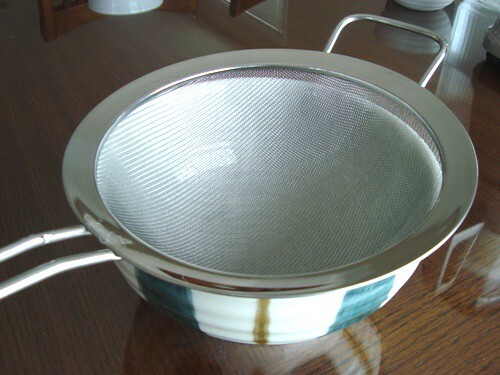 Strain freshly blended almond milk - we pour it into a strainer that sits over a large bowl. 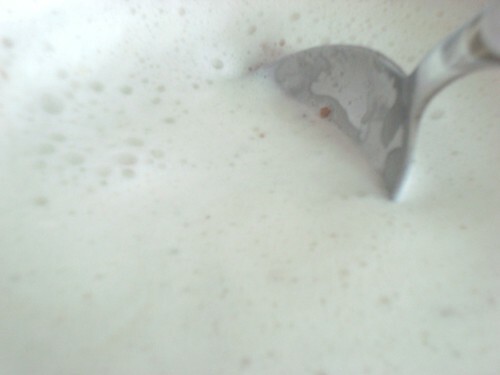 We then use a spoon to gently coax every last bit of milky goodness out of the almond pulp. Still straining - don't want to miss a drop. And voila, you're left with about four glasses of cold and creamy almond milk. It's best to store in an air-tight container in the refrigerator, where it will stay fresh for about four to five days. And what to do with the almond pulp that's left over? You can add it to cereal or a smoothie to boost healthy protein and fiber content. 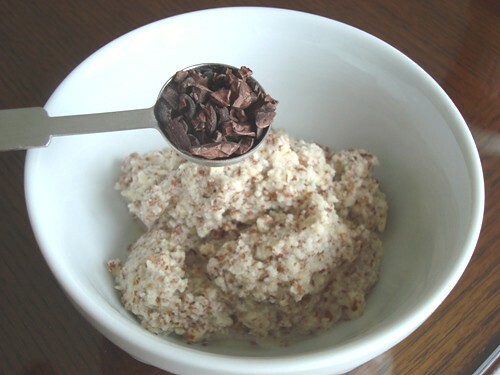 If you don't mind a little chocolate in your life, add some cacao nibs to the almond pulp. Just a teaspoon goes a long way in adding flavor, texture, and health-promoting effects on your cardiovascular system. 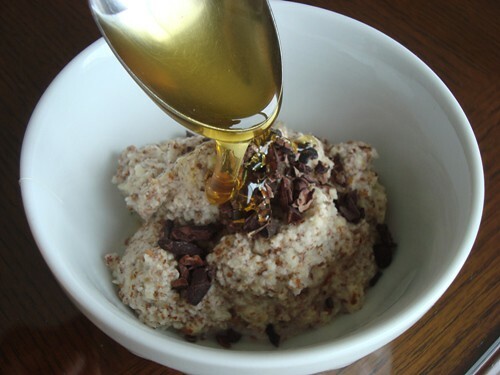 Drizzle a tablespoon of raw, organic honey on top, and that's all there is to it. A simple way to enjoy every last bit of the almond milk-making process. Ah, one last note: if you're a vanilla person, add the vanilla specks from one vanilla bean to the mix before blending. I had always heard that to make almond milk you must soak your almonds overnight to 'sprout' them. I see that your recipe does not call for 'soaking'. Do you have a preference either way? Is there any difference in taste or consistency in the end product by NOT soaking them? Thank you! LOVE your website and especially your recipes! Hi. From what I read, my understanding is that soaking nuts for maybe 24 hours serves the purpose of increasing digestibility and healthy-ness by inactivating certain anti-nutrients. I almost always soak nuts now since I read about this. Anyway, thanks for the recipe, Ben. Likewise, I have always soaked my almonds to 'activate' them prior to crushing them up and 'milking' them. The tutorial on making almond milk inspires me to get back to it again after a hiatus. It's just too delicious and nutritious to miss. 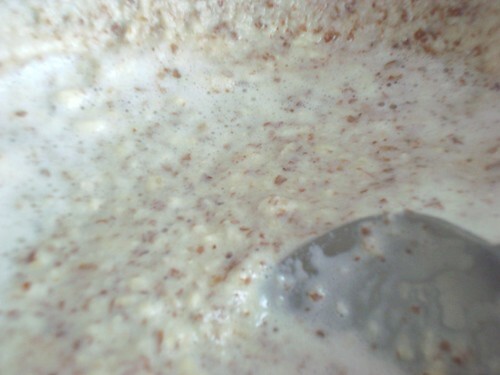 I would like to share that if you care to strain the almond milk through a cloth by lining a bowl or strainer with the cloth before pouring the almond milk in, then gathering up the four corners of the cloth into one hand, and squeezing the bag, you can extract quite a bit more liquid from the 'milk', leaving a still nutritious, but drier, amount of pulp. Thanks so much for such a beautiful, inspiring, and informative website, and for the gentle stance and wisdom you share with your readers. Here is the reason for soaking nuts and seeds for several hours before eating them. The outer covering (brown part on almonds) contains phytates that prevent your body from absorbing minerals, thus acting as an anti-nutrient. There are also other inhibitors, meant to prevent premature sprouting, which are nullified by soaking. The same applies to grains. Be sure to throw out the soaking water and rinse the nuts or grains before using. You'll find more information on this in Sally Fallon's book, Nourishing Traditions. Fallon recommends you soak all nuts and seeds, then, if you're not using them to make a milk, dry them slowly in the very lowest temperature oven with the door propped slightly open, or dehydrator, until they are crispy. This will take a day or two. Also, be sure to remove the hard seeds from dates before putting them into your blender - even a Vita Mix. For an amazing whipped cream substitute, soak a few dates separately from a cup or two of unroasted cashews. Save the date soaking water, but rinse the soaked nuts. Place them in the powerful blender with a bit of the date soaking water. Then blend until creamy. Add the dates one at a time and continue blending. For more creaminess, add a bit more of the date soaking water. You can add vanilla or cacao nibs or other flavorings to this and it makes a wonderful frosting or topping for berries or fruits served as dessert. It keeps in the fridge for a week or so. 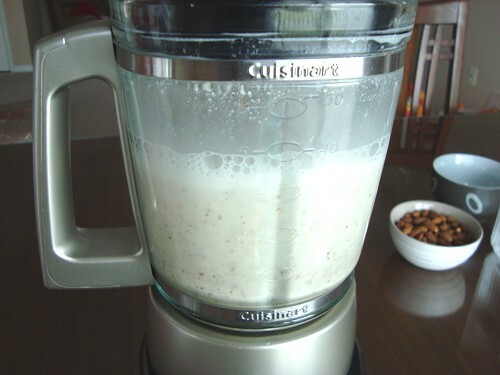 Have you tried adding some tahini (pulped sesame seeds) to the almond milk, especially for banana smoothies? Thank you for providing this wonderful recipe. I didn't realize you could make milk out of almonds! What about other nuts like macadamia, cashew, brazil? Good idea but this recipe can be much healthier. 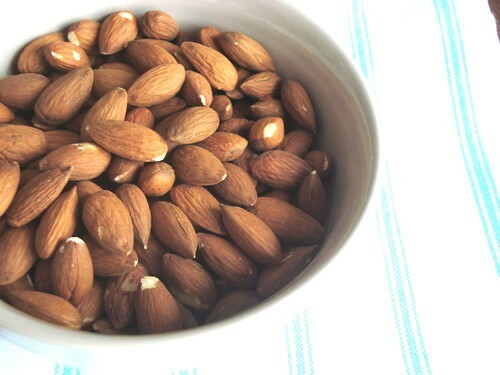 Soak almonds first for at least several hours to soften and also to remove toxins that protect the seed (and all seeds). You can keep soaking almonds in the frig, changing the water everyday, for three days or so. Many thanks to all of the comments and the recurring suggestion to soak the almonds beforehand. 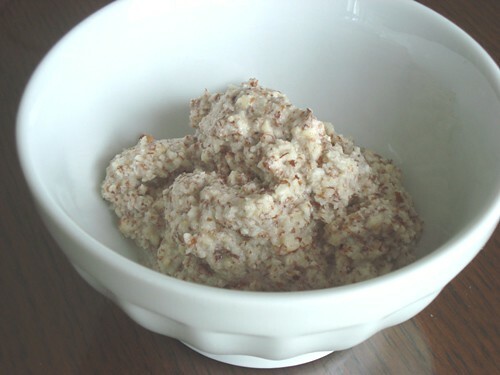 If you click on the link to the recipe without the photos, you'll find that I do recommend that almonds be soaked for a few hours prior to blending - this seems to help improve digestibility for those who have sensitive GI tracts. So yes, to be perfectly clear, whenever possible, I think it's beneficial to soak nuts and seeds prior to eating or blending into milk. And the same basic recipe can be followed with any other type of raw nut or seed. Cashews and Brazil nuts work particularly well. You can even add a little coconut oil to the mix for another dimension of flavor. I loved the recipe for almond milk and I was wondering if there would be a benefit to soaking the almonds overnight first. Can I make yogurt with almond milk? I love to make my own but have questioned how healthy the organic milk I use is. -thanks! I like to make a smoothie with whey protein isolate, fruit, greens, flax oil, etc. I would like to have about 23-25 g of protein in my smoothie and wonder if the pulp from almond milk would be a good substitute for this protein and how much pulp would be about 23-25 g. I would like an alternative to the dairy (whey),which I buy in bulk, but other protein powders (rice, soy, hemp) are more expensive. Do you have any other suggestions for protein if this won't work? I noticed that you do not mention soaking the almonds in the pictoral as you do in the recipe without pictures. Is this an oversight or is it optional? Also, I have been reading the Green Smoothie Girl website, where the author recommends getting RAW almonds, as opposed to unroasted which are pateurized in some way. What is your take on this? I made my first batch of almond milk last night. I soaked the nuts and blended them with purified water, agave nectar, and vanilla. I forgot that your recipe included dates rather than agave nectar. Maybe I can add them in when I drink a class or if I am making a smoothie. My combination of ingredients resulted in a rather bland flavor, so I am hoping the addition of the dates with give it the mild sweetness I prefer. Now I just need to learn how to make rice milk. It is my favorite milk alternative and Rice Dream seems to be getting more expensive at the tune of 4 to 5 dollars a container. Anyway, thanks again and really enjoy your blog. If you are struggling with the flavor try adding some fresh honey and vanilla. Also if you have a dehydrator try dring your almond pulp. Almond flour is great for alternatives to gluten allergies. Or, just have almond flour on hand. This recipe is delicious and is exactly what I was looking for, thank you for your tips and ideas! Great recipe! Has anyone tried using a coffee press to extract the juice from the pulp? Seems like it would work just as well and get the job done faster. Thanks Dr. Kim! Thank you for the easy to do recipe. 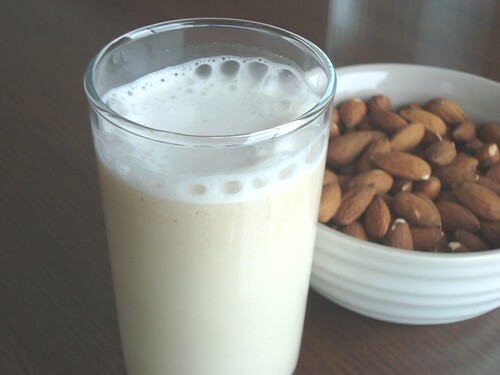 In the Arab world we have been doing almond milk known as "Sharab al Louz" sharab meaning sweet drink and Al Louz meaning of almonds, for hundred of years. 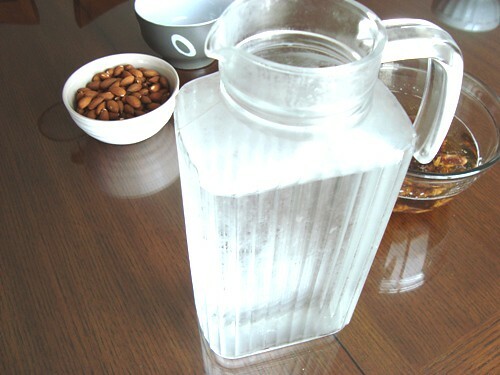 For every liter of water you use 2cups almonds (usually 1/4 bitter almond to 3/4 sweet, it mostly depends on your trees types) which are always presoaked and peeled. We add 1 cup sugar or 1/2 cup raw honey,and 1 teaspoon each of rosewater and orange blossom water. When the almonds are crushed in the water, we always allow it to soak for a few hours to extract as much goodness as possible. Then the pulp is strained and squeezed and the flower waters are added together with the sweetener and chilled for a couple of hours. The result is a delicious fresh thirst quenching drink. This drink is traditionally served in festivities and religious events, where the whiteness of it symbolizes purity, hope and positivity/ good tidings for the future of those who drink it. i'm looking for super healthy alternative for my just turned one year old. he's a super picky eater and I want to ensure he's getting his vitamin D and healthy fats his little body requires. what can I add to my almond milk to get that balance? would coconut oil do the trick? something else? do I need anything? thank you so much!! Hello Amber! You can use the almond milk for your one year old and add Vitamin D that you can find here: https://www.drbenkim.com/sunshop/index.php?l=product_detail&p=101 - I hope this helps! Thank you for the precise recipe. I use a Vitamix with soaked almonds, but I <em>never</em> add any sweetener as I find the taste very good. Just almonds and water is enough for me. Perhaps I got used to less sweet food and drinks as I can enjoy 99% chocolate. Is it necessary to use purified water. All I had was natural spring water, which is what I used... Now, I'm afraid it won't keep as long? !